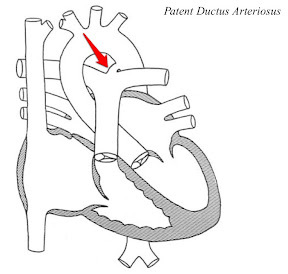 PDA, Patent Ductus Arteriosus is not a typical congenital heart defect. It is a natural condition present in all newborns for the first couple hours or days after birth. It is a blood vessel between Pulmonary Artery and Aorta that allows blood to bypass the lungs and flow back to the body. Since the lungs do not work in unborn yet babies and the oxygen is provided from mother's placenta, there's no need for the blood to go through the full pulmonary cycle, the blood flows from Pulmonary Artery to Aorta and to the body. This vessel usually closes on its own within the first couple hours or days of baby's life outside mother's womb. As I have already said, it is a normal condition, but rarely it happens that this vessel doesn't close on its own and then the normal condition turns in to a heart defect that will require treatment. When blood flows back from the Pulmonary Artery to the Aorta it causes heart murmur that can he heard by a pediatrician during initial exam. If the murmur is still present couple days after the baby was born, an echo (echocardiogram) may be required to confirm sill open PDA. Premature born children can easily get really sick from PDA, which would be another indication that something is wrong. In case PDA did not close on its own or is large and makes the baby sick, there are couple possible approaches. Depending on the size and length of the PDA, small coils may be placed in the PDA using a cath in the Catharization lab through a large vessel. The coils will help the PDA to clot and close. It this option is not viable, there's medication that could be used to help the PDA close. If the medication doesn't work or is not a viable option for the patient, a surgical intervention may be required to close the PDA.